Wishing all my lovely Blog Readers a very Merry Christmas. I hope you have a blessed time with all your loved ones. Thanks for sharing in my stamping journey this year. I look forward to sharing more creations in the coming year – and I hope I can inspire you. Have you checked my Stampin’ Up! website out lately?? (SEE IT HERE). There are a lot of inspirational projects there from Stampin’ Up! Here is one of the cute projects that you can whip up to fill with your special treats at Christmas. This is using the ‘Berry Merry’ Stamp set and the Kraft Takeout Boxes. I made these cards even earlier than the one I showed last post. These are using the set ‘Lots of Joy’ again which is found in the Annual Catalogue. I have to say I made these in a hurry. Just simple cards but they can be done quickly. Both are in Mint Macaron. I have used a left-over piece of the Envelope Paper on the left one. On the right one I embossed a piece of Mint Macaron with the Decorative Dots Embossing Folder. The tree was stamped and punched with the Tree Punch. The white piece is layered on some Silver Foil. I finished them off with the Organza Ribbon. I added some Silver Ribbon to the right hand one. Simple!! LOTS OF JOY FOR CHRISTMAS! I made this card a few months ago before the Holiday Catalogue came out and I was starting to plan for Christmas. It is probably about time I showed you. This is using one of the stamp sets in the Annual Catalogue – ‘Lots of Joy’ and using one of my “go-to” colour combinations of Island Indigo and Pool Party. I first stamped the angled lines in Pool Party and then stamped the baubles firstly in Smoky Slate on a piece of Whisper White and then again on scrap card in Island Indigo and Pool Party. I punched these out with the 1 1/2″ (3.8cm) Circle Punch. They were raised up off the card and I added some Adhesive Rhinestones for the bling factor. The white card piece was matted on to some Silver Foil sheet BUT I want to show you a little trick to save your precious Silver Foil. I cut the Silver Foil to size and then cut a rectangle in the centre. This can then be used for a later project. Check out the photo below. CRAFT FAIR MAKE AND TAKE! Now that I have shared a lot of the projects that I have made for the markets and Fairs I thought I would show you the Make and Take I had at the last Craft Fair event. It had to be quick and I hope impressive?? I made a quick tag. Of course with the very beautiful set ‘Wonderland’. This tag was inspired by one from my friend Vanessa. Simply stamp the trees in Garden Green on a piece of White cardstock and stamp again to stamp a fainter impression. Tear a piece of the Winter Wonderland Vellum Stack to adhere at the bottom. Punch out a small star with the Gold Foil and add a Rhinestone. At the top punch with the Scallop Tag Topper Punch and tie off some Garden Green Striped ribbon. It was a simple one for even those who had never stamped before and they loved it. I don’t think you can make a bad project with this set really. Can you?? Did you realise that this set will not be available after January 4th?? You better grab it now. Don’t regret it. Now how many times have you debated about a stamp set and then after it is gone you realised you REALLY SHOULD HAVE BOUGHT IT!!!! Don’t regret this one. Now before I leave you I thought I would show you my display at the last Fair. We were all squashed in but that was OK right?? This set up was similar to most of the events I have done recently. A close up of the shelves with the boxes and other of the gifts. The Easel Calendars were on the shelf above which you can’t see. 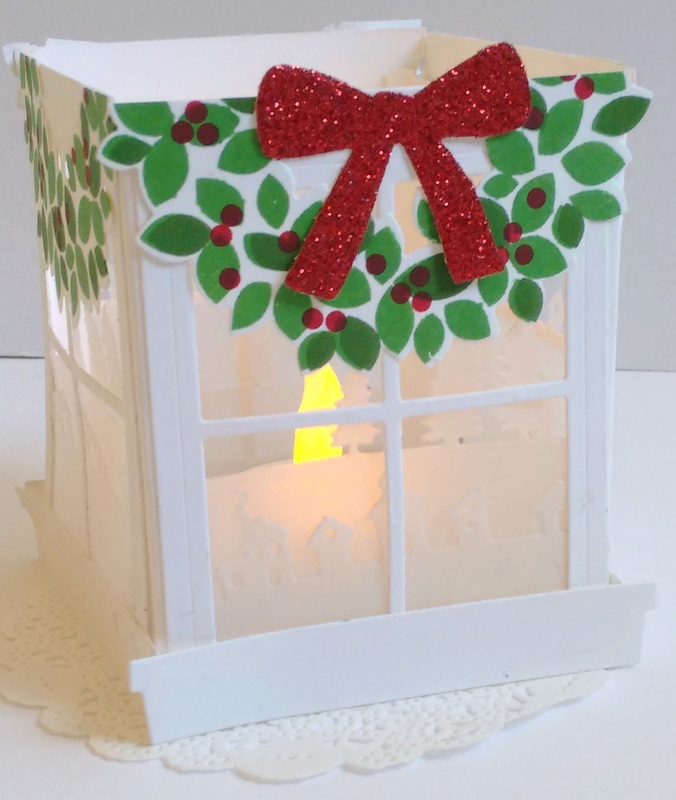 3D projects, Christmas, Classes, Stampin' Up! LAST CLASS OF THE YEAR WITH A SPECIAL LUMINARY! It’s the last class of the year THIS FRIDAY. We have a special project to make. This Luminary was inspired by a few I have seen on Pinterest so I thought it would be nice to finish off the year with. How about it?? Are you local in Wollongong? Come and join us. Here are the details. Friday 4th December – 10am or 7.30pm. End of year Christmas. RSVP ASAP TO RESERVE YOUR SEAT!!! cards, Punch Art, Stampin' Up! ANGEL WITH THE FESTIVE FLOWER BUILDER PUNCH! I found this idea on Pinterest some time ago by a Demonstrator friend Delys. It’s a cute angel using the Festive Flower Builder Punch. How clever!!! It’s always good to find different ways of using the Stampin’ Up! products. I made the angel up some time ago but only recently added it to a card. I will show you a link to Delys’ blog shortly so you can make your own but I will just give you some details on the card. It took me some time to make the card as I was wondering how to make it without the rest of the card taking the attention away from the angel. So I simply layered it on a white oval and matted that on a Gold Foil Oval. This was adhered to a Thick Whisper White card base which I had adhered some of the gorgeous Winter Wonderland Designer Vellum Stack. I had wrapped around some Gold Cording Trim and added the greeting from the Christmas Greeting Thinlets Dies cut from Gold Foil Sheets. What do you think???? So do you want to make your own?? Here is the link to Delys’ blog that shows the pieces you need. Go and check it out. Back to more of our Stamping Weekend projects. I will share some more of the Christmas ones I did. This one I CASED from Pinterest from http://www.bekka.stampinup.net and I changed it up a bit. I have used ‘Lighthearted Leaves’. Isn’t this such a versatile set!! You can use this for Christmas and any occasion. I added my card to a Cherry Cobbler base. The vellum is the Fancy Foil Designer Vellum in the Annual Catalogue. The greeting is from ‘Wondrous Wreath’ which I heat embossed in Gold. I finished it off with some Gold Twine and the centres of the leaves I added some Rhinestones that had been coloured with Sharpies. I love these little penguin dudes. How cute are they!! I have CASED this from my friend Leonie. It is longer than the standard card to fit them all in. You can dress these dudes up anyway you want and cut them with the matching Framelits. This is the inside of the card. I forgot to colour his nose! This next card we CASED from Pinterest too. This is using the set ‘Be The Star’. This is not your typical Christmas set but it is great to use other sets for Christmas. I tore a strip of DSP from the ‘Home For Christmas’ pack and adhered that down the side of a Thick White card base. I curled up the edge a little. I stamped the smaller stars in red near the torn edge. I stamped the other stars in Pool Party and Real Red and cut them out. The greeting from ‘Lots of Joy’ is stamped in Black. The “splodges” are from ‘Gorgeous Grunge’. I added some Rhinestones to the centres of the stars for some added sparkle. We all made this card at the same time. It is interesting to see how different they turned out in different colours. Aren’t they great??? I will see you with more weekend creations next time. A couple of weekends ago we had another fun stamping weekend. These are great opportunities to get lots of stamping done PLUS lots of laughs!!! I thought I would show you some of the projects I made. I think these will be over a couple of posts so be prepared. 🙂 I realised that I hadn’t shown you all the projects from the last one so I might have to get back to that later. For now, here is some of my creativity from the weekend. One of my main goals for the weekend was to make some projects to sell at a few upcoming vendor fairs I am doing. I started off making some bottle tags. These are great for the Christmas period as Wine is a popular gift to give. Why not hang a tag off your wine gift! These ones are using the ‘Wondrous Wreath’ stamp set and Framelits. These ones I have used the ‘Cozy Christmas’ stamp set and the gorgeous ‘Home for Christmas’ paper. These took a while but they were fun to make. I found a few different versions and tutorials for these when I went looking. It all depends on how you want to decorate them or whether you want them longer to fold up the card to make a pocket to tuck a treat in as well. For mine the card measures 20cm x 6.5cm (8″ x 2 1/2″). Score your card at 6.5 cm (2 1/2″). I punched out the circle using the 1 3/8″ circle punch. After making these tags I had lots of circles punched out. What is one to do??? Not waste them now! I used a lot of them on a card. I had some idea in my head but wasn’t sure how it would turn out. Check it out though. I laid the circles out on a piece of Whisper White for the card mat. When I was happy with the arrangement I glued them down and then ran the piece through the Big Shot with the Stars Embossing Folder. Then I used markers on the greeting from ‘Cozy Christmas’ and cut it out using the ‘Tags and Labels’ Framelits and layered this onto a Gold Foil tag. I wrapped around some Gold ribbon and then layered it all on to an Old Olive card mat and then a Real Red card base. Next post I will show you some more Christmas projects I made. I thought I would show you the swaps I received from last week’s team meeting. There are some really cute ones here. I think Tags were very common 🙂 They are great to use as tags or add them to cards. Sorry for the lighting. Sigh! Must do something about this BUT you can get the idea anyway. Now the cute little penguin card in the back does have a head. Sorry about the photo. The penguin is stamped on the inside of the card and a circle window is punched on the front with the hat on the front. It is so cute. I love all these ideas. Thank you to all the clever demonstrators in the Inky Fingers Team. Nice to share ideas. I will show you my swaps. Once again – tags! Now that wasn’t the theme but funny how it works out. I CASED the red one from Pinterest and made up the other in Smoky Slate, Pool Party and Bermuda Bay. These use the ‘Sleigh Ride’ Edgelits. For the red one I punched out stars from Gold Foil using the Star Border punch. The Smoky Slate one I have punched out one star in Silver Foil. Then I added some Dazzling Details for a sparkle but you really can’t see that well sorry.